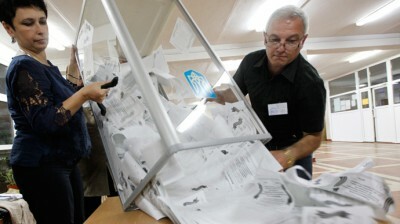 On Sunday, Donetsk and Lugansk regional referendums were held. Democracy triumphed overwhelmingly. Ballot deliveries were impeded. They were “beset by the danger to the life and health of members of election commission” members. Final Lugansk results showed 96.2% for self-rule. Election Committee deputy chairman Alexander Malykhyn announced it. A celebratory 5-6PM Monday rally was held. Thousands participated. They did so under hazardous conditions. They came anyway. New rules apply. Self-determination is official. Kiev putschists have no say. Residents in both regions live under virtual war zone conditions. Fundamental rights matter more. Freedom is too precious to sacrifice. Near unanimity affirmed it. Turnout under dangerous conditions was extraordinary. It was unexpectedly high. In Lugansk it was 81%. In Donetsk 74.87%. Residents in some areas risked life and limb to vote. They did so anyway. In Krasnoarmeysk, special National Guard forces and Right Sector thugs opened fire on unarmed civilians. Two deaths were reported. Others were injured. Fascist regimes operate this way. Kiev acts on direct orders from Washington. He referred to 18th century Russian empire territory. In 1922, it included Southeastern Ukraine. Slavyansk People’s Mayor Vyacheslav Ponomaryov said closer ties with Russia will follow. He’ll make them known at an appropriate time. He recommended postponing Sunday’s referendums. “Why could not the West prevent the use of armoured personnel carriers in Slavyansk and Kramatorsk and avoid the gunning down of civilians,” he asked. Russian Foreign Minister Sergey Lavrov closely followed events. “We have taken note of high voter turnout despite attempts to derail the voting, and we condemn the force used, including military hardware, against civilians, which lead to fatalities,” he said. Russian upper house Federation Council member Sergei Tsekov said Donetsk and Lugansk regions demonstrated real choice. World nations should recognize it, he added. On Monday, EU foreign ministers met in Brussels. They discussed Sunday’s referendums. They considered policy options going forward. They include possible sanctions on 15 more Russian officials and five Crimea-based companies. On Monday, European Council President Herman Van Rompuy visited Kiev. He came to support its coup-appointed government. He discussed preparations for May 25 sham presidential elections. They’ll be illegitimate when held. EU nations support them. So does Washington. Western countries endorse what demands condemnation. They criticize real democracy. They deny their own people fundamental rights. They want other nations denied theirs. On Monday, Sergey Lavrov said no new meetings on Ukraine are planned. Efforts to resolve crisis conditions so far accomplished nothing. “I have heard statements by Ukraine’s Acting Foreign Minister (Andrii) Deshchytsia and While House spokesman (Jay) Carney to the effect that the four-party format of the talks should be preserved, but I shall say once again that, without including the regime’s opponents into the direct dialogue over ways of settling the crisis, the efforts will go nowhere,” he said. Lavrov commented on flagrant Western lies relating to Donetsk People’s Republic statements he made. He hopes implementing referendum results going forward will proceed smoothly. Washington and rogue EU partners reacted to Sunday’s referendums as expected. They denounced real democracy. Hostile public statements won’t change things. Donetsk and Lugansk residents spoke. They did so courageously. They affirmed their legitimate rights. Their democratic ones everyone deserves. They did so overwhelmingly. They reject Kiev fascists. They acted responsibly. They deserve universal support. On Monday, Kiev troops attacked Andreevka village. It’s about 100 kilometers from Slavyansk. “There was an artillery attack,” a self-defense spokesperson said. It began pre-dawn. Repeated explosions were heard. Firing came from Karachun Mountain’s TV tower vicinity. Checkpoints were attacked. So were residential areas. Kiev tried disrupting Sunday’s referendums. It failed to do so. Assaults on self-defense forces and noncombatants continued on Monday. It bears repeating. Fascist regimes operate this way. Kremlin authorities urged implementing it peacefully. People spoke. They did so overwhelmingly. Their will matters. It bears repeating. It deserves respect. It merits universal support. It’s polar opposite Washington’s way. It’s the right way. It’s a model for people everywhere to follow.